Electric wax warmers are essential in our lives with people using them for various purposes. The warmers can be used for therapeutic healing while others use it to improve the quality and texture of their hairs. These are better alternatives to the traditional way of melting wax. Just imagine a professional salon setting, or when traveling, the warmers come in handy saving you time and wastage. 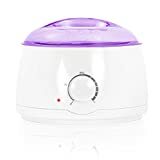 However, choosing the best electric wax warmer can be a challenge for most people. The market is filled with all sorts of models and brands or claiming to deliver the best. When looking to buy one, you need to consider capacity, temperature control, safety, heating speed, and portability. To help you with your selection, we have reviewed some of the top warmers currently in terms of performance, capacity, and value for money. The Makartt is a suitable pick when looking for a wax warmer that can be used on most types of waxes. The melting pot is big enough and accommodates almost all types of wax formats. The temperature of the the wax can easily be accommodated with a light indicating the temperature chosen. It is quite safe to use without burning your skin with a removable liner bucket. There is a see through cover that produces the required heat to melt the wax and keep it free from dust. Allows adjusting the temperature to what suits you. The GiGi is a compact electric wax warmer and one that will offer you good value for money. The warmer is thermostat controlled which means you get to control the heating temperatures and get the desired wax warmth. It is a durable unit with an aluminum cover and one that will serve you for long. The top cover is see-through with the warmer designed to hold 14.0z of cans. 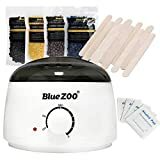 The Bluezoo is a good value for money kit when you get a wax warmer, ten sticks and four packs of wax beans. This is an efficient heating warmer with very advanced temperature controls. Users can easily get their wax melting to desired temperature points with ease. This is a very easy to use warmer and ideal for beginners. You just need a spatula and the wax warmer, and you’re ready to go. Hair removal is even made much easier with the waxing sticks. 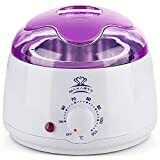 This is a well-built electric wax warmer and a good pick on our list if you’re looking for something to last you for long. It is a durable option that warms all types of wax. The warmer has a unique circulating heat element that warms and melts wax faster and in an even manner. The liner bucket is removable while the top is see-through. This is a nicely designed warmer that holds 14-ounce cans, bricks, and loose wax. This is an elegant wax warmer convenient for salons and homes. It is a versatile choice and a great addition to any home or salon. The design is great making the warmer portable. It is a perfect option for those who travel often. 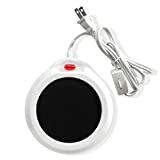 It is a high-quality warmer made from the heat-resistant material and heavy electric cable to withstand any temperatures when melting your wax. The warmer is safe to use with a see-through lid to prevent accidents and contaminations. 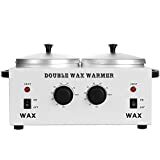 If you’re looking for extra-large waxing areas or just in need of multiple treatments then the Double Wax Warmer if the best choice for that with doubles pots. It is a great choice with a strong metal construction of aluminum to serve you for long. The design is great with on/off switches for easy use. There is a red indicator that tells you when the unit is on and running. Users can easily adjust temperatures from as low as 0-80 degrees. The two handles make it quite easy to transport. This is another great choice with a perfect paraffin mask that works well both on the normal and dry skins. The temperatures are adjustable with lights indicating when the unit is on. The auto shut off function helps keep the unit safe when you’re not around, but the warmer is on. The see-through cover further helps provide even melting of the wax while also allowing you to observe the state of the wax. 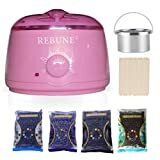 The Rebune is a brand name in the industry and a great pick if you’re looking for a high-quality wax warmer. The aluminum container is quite durable and removable making it easy to prepare for wax heating. You can also adjust temperatures from as low as 0-60 degrees. This is a suitable unit for all types of waxes and a great fit for professional use. The Parissa is the ideal wax warmer for regular waxing and one that makes complete sense buying. It is small, compact and lightweight ideal for traveling with wherever you go. 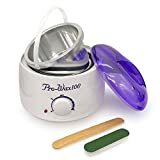 The warmer heats your wax and keeps it at the right temperatures throughout your treatment. With the long cord cable, you can always have the wax by your side at all times. 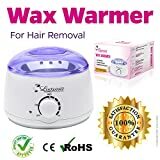 This is the best wax warmer currently and remains highly recommended for all types of waxes. The warmer comes with a convenient on/off button that can easily be adjusted to suit different temperatures of high, moderate and low. The cover design is see-through allowing the user to view the state of the wax during the heating process. This further helps prevent unnecessary accidents and contamination. The liner bucket is removable and easy to clean and maintain.